Over the past few months, Bitcoin Decentral, the new Toronto-based Bitcoin community center and coworkingspace that has been operational since the start of the year, has come to take center stage in the Canadian Bitcoin economy. Progress toward renovating and furnishing the upper floors of the four-storey house are well underway, and even now the location serves as the headquarters of KryptoKit, the Bitcoin Alliace of Canada, the organizing committee for the upcoming Bitcoin Expo and the Canadian arm of Ethereum as well as the site of a weekly meetup that attracts 50-100 attendees. 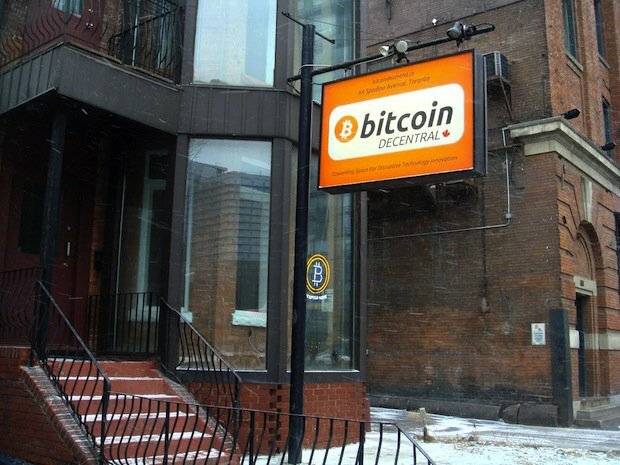 The site is one of three similar locations in Canada, alongside the Bitcoin Embassy in Montreal and a smaller community center, also named Decentral, located in Vancouver, and the concept of a “Bitcoin embassy” is rapidly taking hold in countries all around the world. Now, Bitcoin Decentral has announced that it is launching its newest program: a Bitcoin and cryptocurrency 2.0-specific startup accelerator. The program, entitled Bitcoin Decentral Accelerate, is a standard three-month startup acceleration program, in which participating startups will be able work together at Bitcoin Decentral and enjoy the benefits of specialized in-house legal counsel, shared office resources and the assistance of and a number of expert mentors, investors, and business owners experienced in the cryptocurrency space. Startups will receive these benefits, alongside an upfront injection of a yet-to-be-determined quantity of cash, in exchange for a seven per cent stake in the company, and will also be eligible for an additional larger investment at the end of the three-month program. Managing the Bitcoin Decentral Accelerate program is A. Traviss Corry, who previously managed the Toronto-based incubator program Incubes until a dispute with Incubes CEO Ben Zlotnick led to his departure. Also involved are Anthony Di Iorio, founder of Bitcoin Decentral, as CEO and William Mouyagar, founder of Startup Management as special advisor. Erik Voorhees, a long-time Bitcoin advocate well-known for his involvement in a number of Bitcoin startups, including BitInstant, SatoshiDice, KryptoKit and his current main project, Coinapult. Coinapult is currently a service for sending bitcoins by SMS and email, but intends to soon become a powerful international Bitcoin exchange. Andreas Antonopoulos, a Bitcoin security expert and frequent speaker at Bitcoin conferences, also serving as a permanent co-host at the Bitcoin podcast Let’s Talk Bitcoin and more recently the Chief Security Officer at blockchain.info. Tony Gallippi, founder and CEO of BitPay, a Bitcoin payment processor that allows merchants to accept Bitcoin payments and optionally have the funds immediately converted into local currency in their bank account, thereby instantly protecting them from all Bitcoin price volatility risk. The company charges processing fees of only 0.01-0.99%, and now has over 25,000 merchants signed up. Jason King, founder of Sean’s Outpost, the now famous Bitcoin-accepting homeless outreach program in Pensacola, Florida, and the associated permanent shelter Satoshi Forest. David Johnston, co-founder of the Bitcoin angel investing group BitAngels and director at the Mastercoin Foundation.